Mr Owen Anderson studied medicine at the University of Edinburgh. He undertook further general medical training at Addenbrooke’s Hospital in Cambridge before commencing ophthalmology training in London. This included a number of years at Moorfields Eye Hospital in London as both a Specialist Registrar and a Fellow. During this time he was also awarded a PhD from University College London for research into age related macular degeneration and ocular drug delivery. 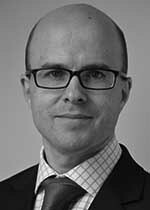 Mr Owen Anderson was appointed as a Consultant Ophthalmologist at the Royal Bournemouth Hospital’s Eye Unit in 2014. He has experience in general ophthalmology, including cataract surgery, and has a specialist interest in medical retinal diseases including age related macular degeneration, retinal vein occlusion and diabetic retinopathy. Mr Owen Anderson does not hold a share or financial interest in this hospital, another Nuffield Health hospital or the company. Mr Owen Anderson does not have a share or financial interest in equipment used at this hospital or another Nuffield Health hospital. Mr Owen Anderson does not hold any paid advisory role(s) at this hospital or on behalf of Nuffield Health.